Like most children of the late 70's and early 80's, I was in thrall of Robin Williams' quirky character, Mork. Mork and Mindy was a watch or die show for me. I knew when it was on, and demanded command of our only color TV to watch it. It was convinient that my mother also enjoyed the show, otherwise I doubt my demands would have been met. It seemed like Mork was everywhere we went in those days. The newsstand sold Mork and Mindy trading cards. Rainbow suspenders were sold at every flea market stand (and yes, my mom bought me a pair and I wore them to school well beyond the acceptable coolness period.) But what I remember most were the toys. I wanted them all. The talking Mork fall, the stuffed Mork, the little Mork in the egg ship... I made it clear to my mom that I needed my Mork. I even tried to get my mom to by me the Ben Cooper Mork costume for Halloween. It didn't work. I ended up in a homemade costume of either a Bunny or Tiger that year. 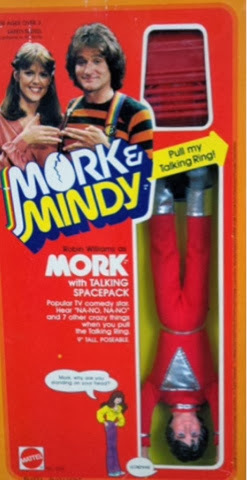 Not having Mork toys didn't prevent me from playing Mork, though. I had my trusty Decker action figure and a piece of electrical tape cut into a triangle on his chest. Instant Mork. For his egg ship, I confiscated one of my mom's pantyhose eggs. Thank you Leggs for that marketing brilliance! It was on one of those Mork adventures that Decker ended up on the kid next door's roof. Bye bye Decker... Bye bye Mork. I told my mom about how I lost my "Mork" and I could see she felt bad for me, but she said nothing. I moved on and tried making my John Travolta into a Mork, but without a ship it just wasn't the same. I usually got all the good stuff on Christmas the week before, so I didn't really expect much in terms of toys. I was wrong... And I was never happier being wrong than that moment. I unwrapped my gift (in Christmas wrapping, as all my birthday gifts were usually wrapped in) and there stating back me was the Mattel 9inch Mork doll! He was upside down in the box and he talked. It was actually a backpack you put on him that made him talk, but that didn't matter to me. That was his flight pack as far as I was concerned, ala James Bond and that episode of Gilligan's Island. The first thing I did when I got him out if the box was take his clothes off. I don't know why. I just always did that with all my toys. I tried to put Mego Spider-man's suit in him, but it didn't fit. I put some generic GI Joe marine combat fatigues, and went to town. I finally had my very own Mork doll... And the first thing I do is play army. If you have a question, I may have an answer. How can I help you?